PLA Camp is for those actively working through Pathfinder Leadership Award (PLA). This is intended as the first step in equipping leaders to minister to their Pathfinders. Instead of theory in a classroom, we will experience and participate in learning, just like your Pathfinders need to. Applications close Monday, 18 February 2019. 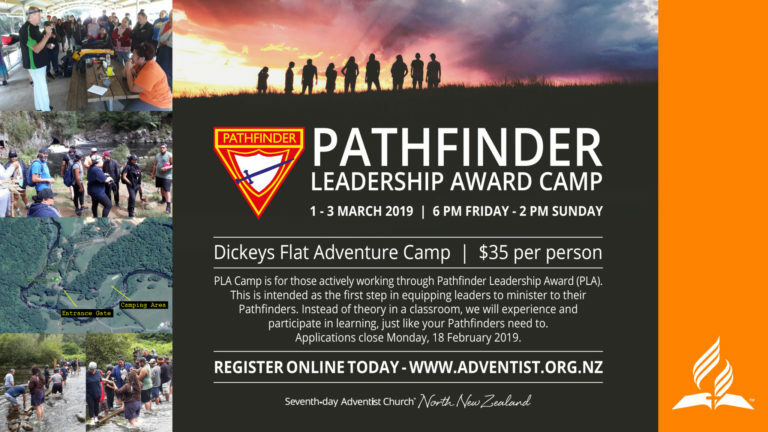 When: 6 pm Friday 1 March – 2 pm Sunday 3 March Location: Dickeys Flat Adventure Camp – Dickey Flat Rd, Waitawheta. (NOTE: this is NOT the DoC camp). https://dickeyflat.com Cost: $35 per person. Camping: please come equipped to base camp with all your own equipment (food, tents, sleeping mats and sleeping bags). You will also need gear for a half day walk, wet weather gear, etc. There is flush toilets and hot / cold water for washing dishes.